“Oooh…you’ve got an Enomatic machine.” I was as excited as man having a mid-life crisis contemplating the polished red metal of a brand new Ferrari. Why was I excited? Yuwraj Seetamonee, sommelier of The Whistler, at the new Ocean View Hotel, The Walk (JBR, Dubai) had just led me into the wine room and pointed it out with a sweep of his arm. 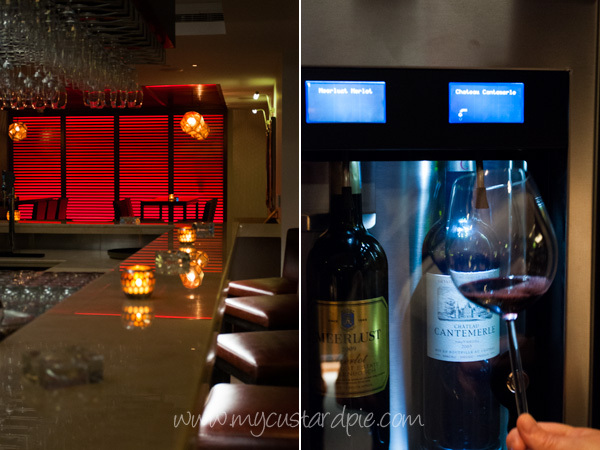 This sophisticated piece of technology is a wine vending machine (very expensive bit of kit too – there are only three in Dubai); the main advantage is that it keeps an opened bottle of wine in pristine condition for 21 days. This means that all sorts of interesting wines can be dispensed by the glass (rather than the usual limited range). You load up your card with credit, insert it in the relevant slot (a credit card for wine, oh yes) choose to taste, sip or glug (size wise) and your chosen wine flows into your glass. Wine nerdiness aside, there are a handful of things that get my pulse really racing these days. A room full of interesting cheese is one of them, and lo and behold, The Whistler had one of these as well. Cheese and wine. Now that’s a match made in heaven. Not all cheese and wine go together like Brad and Angelina….some matches are more Brad and Jen i.e. OK at first but then something is not quite right and it leaves a strange taste in your mouth. There are a few general rules about cheese and wine matching (see below) but the best part is to try which combinations work best for you; here at the Whistler we (me and fellow cheese fanatic Francine aka Mrs Life in the Food Lane) marched in and started bombarding the chef with questions about sheep’s milk or goats, ripeness, washed rinds etc. (poor man). There was some interesting stuff in there including a cheese made around a single piece of straw and one matured in a fig leaf (should be called Adam?). Sadly the server had limited English and an even more limited knowledge of the cheese. However we were happy with our choices on the whole, although a bit lacking in blue. Yuwraj confessed to not liking cheese very much, but he did a good job of guiding us through the wines and we nibbled our way through. Araldica de La Luciana Gavi was very neutral, La Chablisienne Petit Chablis 2010 had some lemon peel notes which went really well with the Comte. Les Eglantines, Touraine, Sauvion, 2011 – a Sauvignon Blanc from the Loire, was fresh and green with pea pods on the nose ripe gooseberries on the palate; it was excellent with Brie. I’m a big fan of many wines made of Torrentes which has become the white grape of Argentina, however the Colomé Torrentes 2011 lacked freshness. Hmmm… we should have suspected something then. We started the reds with Punto Niño Carmenère from Chile. When we got to the Enrique Foster Malbec I was confused. “Umm, tastes a bit oxidised to me,” I muttered tentatively. Yuwraj looked shocked, tasted the wine and opened a fresh bottle immediately. The machine had been disconnected recently and clearly some error was made in getting it back up and running. The subsequent Chateau Cantemerle 2007 was also lacking freshness and replaced. Returning a couple of weeks later with Sarah and Dima, a different sommelier, Anastasia, guided us through the cheese and wine education process. On the plus side she was really enthusiastic and chose the wines specially for us, with care. She came up with some wine and cheese matches which surprised us like Gran Tesoro Viura 2009 with a creamy Brillat Savarin, and a Pouligny-Saint-Pierre with Rosé d’Anjou ‘Chemin des Sables, Domaine Sauvion. On the downside, a couple she chose from the Enomatic machine were oxidised again (clearly not a temporary blip) and the bar was empty except for a steady stream of people who came in just to look at the view from the terrace and walk out again. There was no way we could use all the credit on our Enomatic cards in addition to the wines tasted (and still walk out in a straight line). It took me a few weeks to write this up and since then The Whistler has changed its concept. The cheese room has been transformed to a sushi room. Wine by the glass from a wide selection remains, but there will be ‘shooters’ and sake. It’s a shame as the one-to-one wine and cheese pairing was unique – albeit unsustainable if the bar got busy. Wine and sushi matching? Who knows. The 99 till 9 promotion still runs which means a bottle of wine (from a selected list) for AED 99 until 9pm every day. For the Enomatic cards you just buy a pre-paid card and help yourself. The list of sushi and more details here. Every Wednesday you can choose from 50 wines and a selection of cheese from their impressive cheese room for 195 AED. This is no sedate tasting however as there is a live band. Every other night you can taste a wine flight with choices such as the “Sauvignon Challenge” or “Clash of Titans”starting at AED 99. Their cheese selections of 3, 5 and 7 cheeses start at AED 68. Every Wednesday, from 7:00pm to 10:00pm, there is a buffet of over 20 French cheeses including Bleu d’Auvergne, Morbier and Galet de la Loire matched with French and international wines for AED 180. You can upgrade (by paying 250 AED) and receive 50% off the best French or Millésime wine. A really entertaining jazz duo played there last time I went. Ossiano offers cheese from Hervé Mons, plus the sommelier’s selection of wine. Daily 7pm-11.30pm. AED 150 for plate of 6 cheeses, AED 75 for plate of 3 cheeses. Offers a range of very good quality English cheeses as part of the cheese board on their menu including a delicious Wenslydale. The Souk Madinat branch will hold a cheese and wine event for you and your friends if you ask them. Want to come? The longest standing provider of cheese and wine in Dubai has a special night every Wednesday. There’s a cheese buffet showcasing farmhouse cheeses from around the world, artisan breads, homemade chutney and cold cuts. AED 185 per person including wine. Also unlimited cheese fondue and wines 7pm onwards every evening at AED 145 per person. 20% off with a Wafi card if ordering cheese and wine from the a la carte menu. For cheese and wine with a view, there’s a ‘Grape & Cheese’ night at Uptown Bar every Wednesday from 6.00pm to 12.00am. AED 450 for a cheese platter with a selected bottle of red or white wine. Tel: +971 4 501 8888 For more info and to book the event visit the Lime and Tonic website. So are you a cheese and wine fiend like me? Any cheese and wine matches to recommend? 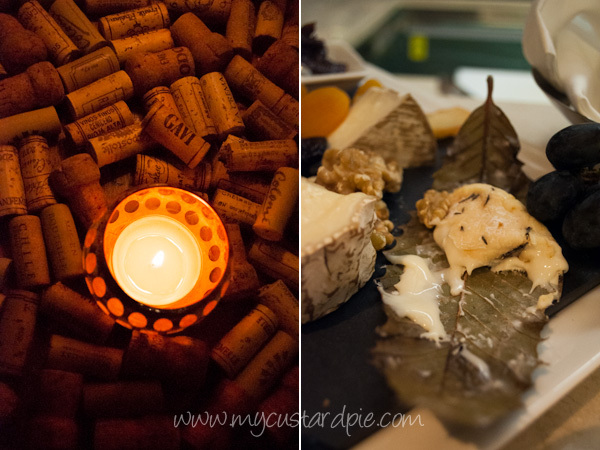 Where would you recommend to go for great cheese and wine tasting (in and out of Dubai)? Disclosure: I was a guest for my first visit to The Whistler but returned under my own steam. All opinions my own. Great article Sally, wish I was more of a cheese lover than I am – or maybe I’ve just not found the right cheese yet. My bet is you would have like the Brillat Savarin coated in truffle honey we tasted on Thursday. 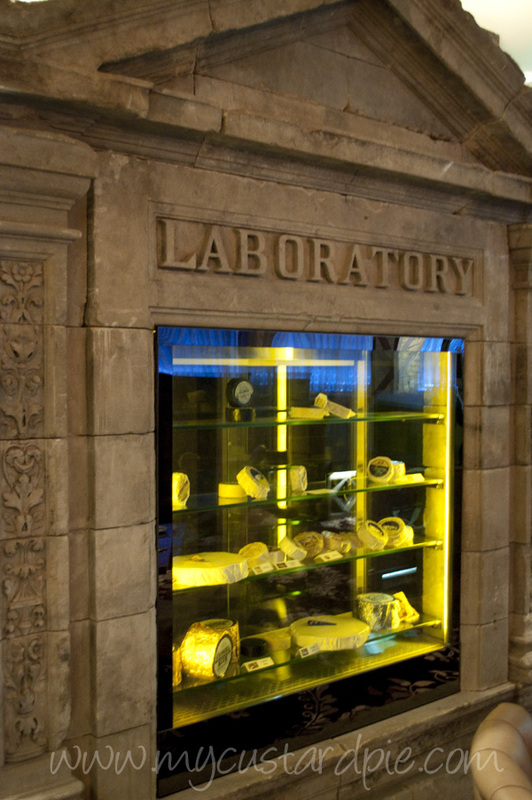 It also had 24 carat gold leaf in it. Very Dubai! What an interesting and, as always, inspirational post Sally. Cheese and wine are two all-time favourites! Thanks for broadening our knowledge, tempting our taste buds and inviting us with such warm, quiet confidence to try new combinations. Thank you!! Ah you make me blush Tara – thanks for such a very kind comment. Great tips! I love cheeses and find that they pair wonderfully well with wine. I do so agree about wine and cheese Rosa – thanks for commenting. Good honest write-up Sally! sad when a concept doesn’t work and cheese and wine are a plus in Dubai I’m sure as opposed to sushi…..
It’ll be interesting to see their sushi offering – I’m a big fan. There is a lot of choice for sushi in Dubai but perhaps not in a bar so they may be onto a winner. It’s still worth visiting for the wine ‘on tap’. Love the graphic to remember the pairings! Wine and cheese are always a good idea. If you ever have the chance you should make your way to Asturias, Spain for some cheese and cider too, it is fantastic! I must admit to not being at all fussy what I drink with what…although I love the graphic and I shall refer to it next time I am not sure what to get in for the Weekend. That pyramid of cheese at the top is just beautiful! Taking baby steps towards mastering Photoshop so quite pleased with that graphic (a LOT of trial and error). Glad to hear you could live on cheese (I practically do!) as this is part one in a series of cheese posts – just writing up my cheese and wine tasting with Patricia now. Wine and cheese matching is quite personal and it does depend on the style of the wine. Personally I think that Cheddar and Pecorino would be great paired with Merlot. I would choose a Pinot Noir with the Saint-Nectaire (the mushroom characters) and a sweeter wine with the Roquefort (although now intrigued to try with Merlot). Like chocolate and wine, the pairing works for some people and not others. She did come up with some terrific combinations though. Every buffet in Dubai has sushi so I guess there will be a competent delivery – the publicity pics look good and it’s good value with the sake shooters. It seems to sideline the wine room though – a bit of a shame. The Lime and Tonic deal looks amazing. I hope it’s still running in September because I am eager to visit and haven’t been to Vintage for ages which I must rectify. Thanks for such a lovely long and thought provoking comment. As usual, for enthusiastic ‘learners’ like me, your posts are always a pleasurable read as well as ‘memorable’ in the sense that you make it easy to remember. That graphic chart is definitely going to be ingrained now. Good to see so many cheese options in Dubai. 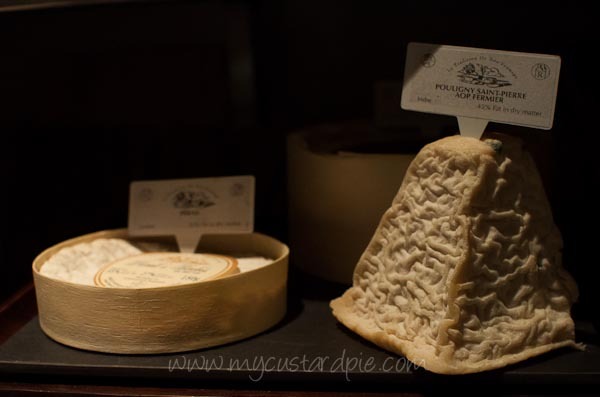 About Jones the Grocer – their Cheese Club is held in the restaurant itself? I have always liked the idea of wine and cheese pairings but now feel more enthusiastic about it. This is a great series for us ‘newbies’ and look forward to your upcoming posts. Oooh Sal, thank you. I haven’t tried Sancerre and blue cheese, I’m going to add that to my list. I usually serve blue with vintage oporto, and the last time I had Sancerre with cheese it was a triple brie. What a shame the wine and cheese tasting is finished, it sounded wonderful! 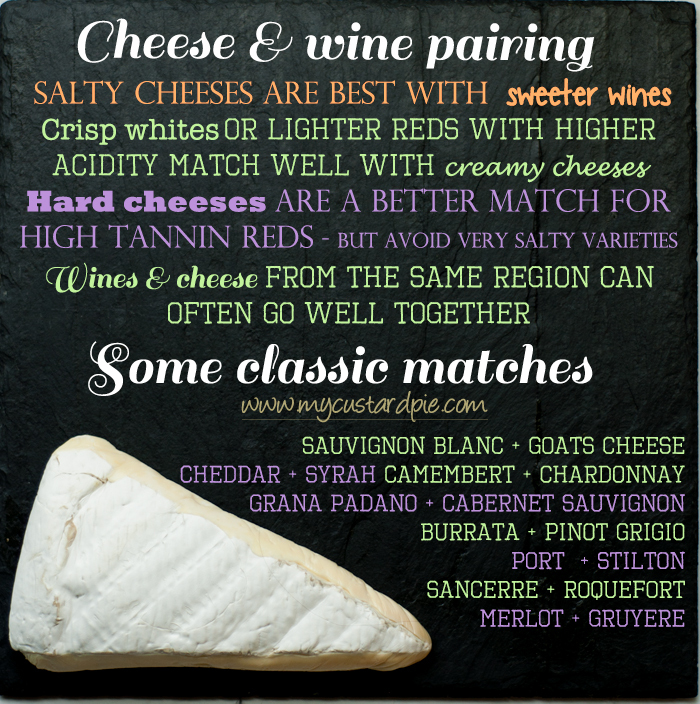 Love the graphic for matching cheese and wine! Very informative post and indeed such a shame they changed the concept! I myself enjoy beer more as a pairing with cheese. Dubai really is a foodie haven! See you end of this week Sally, can’t wait! Mmmm, cheese. I am a total cheese-o-phile and this concept sounds like my idea of heaven – what a pity it was discontinued. 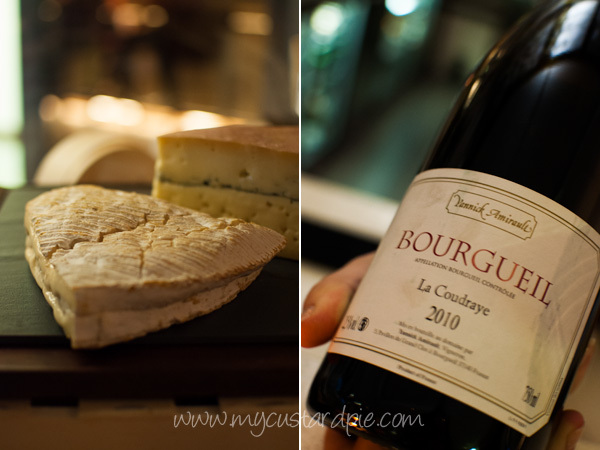 Is that a Morbier I spy in that one diptych with the Bourgueil bottle?? Cheese would form a large part of my last meal on earth. It could well be – and yes agreed cheese would be in my desert island dishes too.